Why the contemporary Russian elite cannot be considered the heirs of ancient Russia. Heir to two noble lineages, Stolypin and Sluchevsky, descendant of the first wave of Russian emigres following the Revolution, President of the Non-commercial partnership “Stolypin Center for Regional Development”, Nikolai Sluchevsky shares with “Ogonyok” his views on how the Revolution divided Russia and how the reconciliation between the ‘reds’ and ‘whites’ continues to be impossible. In order to understand what is happening in Russia today it is extremely important to understand what happened then, in the watershed period of 1917. In part this can help answer the question: does there remain anything in common between the community of the White émigré Russians and the post-Soviet Russians of today? 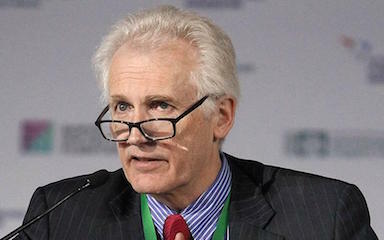 Nicholas Sluchevsky, Director of Stolypin Centre for Regional Development. It is important to note that, in this context, when I speak of the ‘émigré community’ I am quite specifically referring to the descendants of the 1st wave – those that left immediately after the Revolution. The 2nd through 4th waves are distinctly different from the 1st wave in that they all had experienced life in the Soviet Union directly, albeit during different periods. I also wish to make clear that, obviously, I do not speak for the entire White émigré community. (This last statement did not appear in the Russian version). Allow me to begin with the main question: do the White emigres resemble the ‘post-Soviet’ Russians? Are we all still the same people as described in (pre-revolutionary) classical literature or not? My answer is no, we are categorically different people, albeit speaking the same language. The experiences that each of these groups went through after the Revolution is radically different. Our respective values have split, our relationship to our history and traditions bear little resemblance to each other, and the way that we perceive ourselves is also completely different. It is hard to imagine the possibility of any deep ‘understanding’ between us. Having said that I do not mean to imply that there should be no dialog between us, or, indeed, joint efforts to develop our relationship. However, our significantly different starting points and respective world-views cannot be underestimated. 1917 was not merely a historical episode but, in fact, the end of one history and the beginning of another. In a certain sense the Soviet Union and its admirers today relate to Tsarist Russia as a murderer does to his victim – with all attendant consequences. I recall the famous Churchillian quote: ‘nothing separates the Americans and British more than our common language’. This fully characterizes the state of relations between the White émigré community and today’s post- Soviet Russians. (Note: post-Soviet Russians refers quite specifically to those old enough to have been schooled and raised in the Soviet Union, not today’s youth) It does appear that we mouth the same words: ‘the rebirth of Russia’, ‘getting up off of our knees’, ‘Holy Russia’, but the reality is that we understand these words in completely different ways. We connect these terms with different things entirely. Perhaps the clearest example of this lack of understanding, evoking shock in much of the White émigré community, lies in the question of ‘reconciliation and redemption’. In today’s Russia the standard view is along the lines of: some of my ancestors fought on the side of the ‘Reds’, while others on the side of the ‘Whites’, but in the end it doesn’t matter because each fought for the glory of Russia. Therefore there should be peace (reconciliation) between us! For the 100 year anniversary of the Revolution the government appears to have ordered all celebrations to be promoted in this ‘reconciled’ tone. For ‘us’ this is completely unacceptable (again, I speak for myself and those who think as I do). Quite simply, there cannot ever be reconciliation without redemption and while today’s Russia promotes this line of reconciliation without redemption, ‘we’ will continue to consider the country ‘cursed’ until such time as there is a national redemption (also missing in the original Russian text is the statement that I do not refer to ALL post-Soviet Russians thus; in fact there are far more post-Soviet Russians with historical knowledge and traditional values very much intact and in concert with ‘our’ own, than would appear at first glance.) While the government continues to insist that ‘all cats are grey’, and the Stalin myth remains popular, Russia will not find redemption. We will continue to have people in power extolling the human sacrifices made during Soviet Russia as being for the glory of ‘great Russia’ – and there certainly were many who died heroically for Russia during WWII - but why, in the 21st century, must ‘glory’ and ‘greatness’ be defined solely in such military tones, and what of the innocent victims of the gulags? Let me be perfectly clear - such ‘reconciliation’ is pure evil and dishonour all the innocent victims of Bolshevik Russia. Such ‘reconciliation’ destroys any moral compass a nation can have. What is there to say? Lenin’s attempt to create a new ‘Soviet’ man was largely successful. Orthodox symbols, traditions, icons were wholesale exchanged for new, Soviet ones. Nevertheless, the ideas and principles carried in the historical tradition simply did not translate into this new paradigm. Service to God, Tsar and the Motherland were substituted by total subservience to the State, a fundamentally different concept. Not everyone today would understand the difference between service and subservience. This substitution of basic values with which so many citizens of Russia today grew up is likely to remain with us for the foreseeable future. Many of today’s political and intellectual elite are attempting to recreate, at least to their own satisfaction, a ‘Russian identity’. They hope to restore the ‘historical memory’ or, to be more precise, use this ‘historical memory’ to expand their own Soviet identity which, for some reason, no longer suits them. For these ‘re-constructors’ and schemers the use of symbols and images associated with the White Movement are a very valuable resource for gaining legitimacy for their own ambitious schemes. In fact, to view the spawning of such chimera is, for many of us, very painful. What ‘reconstruction’ can there be without a profound, emotional period of adjustment, without a spiritual debt paid to the 1000 year traditions of ancient Russia? Without an honest appraisal of what was good and what was bad? Let’s take, for instance, a seemingly trivial thing, such as the headscarves worn by so many women upon entering an Orthodox church. Most people believe that this is our native and ancient tradition but it is nearly completely absent in the White émigré community of my parents and grandparents. This was a primarily peasant tradition which rarely migrated to the cities. Today, however, most women have adopted this custom under the ‘protection’ of Holy Russia. (Author’s note: viewed as fashion I have no problem with this, but when churches prohibit women from worshipping if they lack such head covering, that I have a major issue with. Once again, it is about subservience, not service.) The source of this custom is apparent – at the time of the Revolution some 80% of the citizens were peasants, and the imagery associated with peasant life after the Revolution was preserved and extolled, while the life of anyone who could be called bourgeois or aristocratic was reviled and erased from the public memory. (I’ve been called arrogant and high-minded for making this observation.) In the end one can legitimately orient one’s identity towards peasant culture and creatively develop it, but all the options should be available and there should be freedom of informed choice by the individual. However, in any case, one must give an honest answer to oneself – for what reason are we ‘restoring’ something and what, exactly, are we restoring? Russia, of course, has long-suffered for its 1000 years old adherence to myths and ‘sacred legends’ rather than on objective historiography. Myths are likely just as popular with the White emigres as with post-Soviet Russians, but the motivations that lie behind such myth creation are quite different. In the beloved mythology of the Soviet Union – from ‘getting up off our knees’ to the restoration of great power status – there is virtually no space for the person, the individual as a valued contributor to the motherland. Only as a symbol does the person matter. 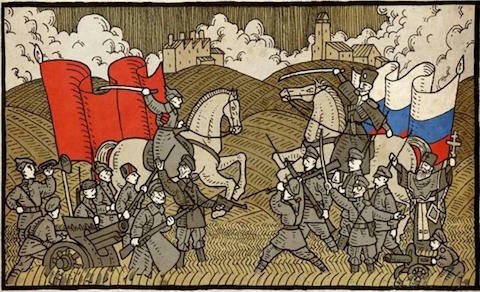 Contemporary Russian mythology is directed at the masses (purely Soviet), calling on them to band together against ‘common enemies’ which, of course, are everywhere. It is assumed that the individual is not called upon to serve based on status (as a citizen) but on ‘situation’ (e.g. threats), and this is a nuanced difference connected to the loss of personal responsibility. To summarize my, regrettably, quite harsh comments, I must state that the contemporary Russian elite cannot by any means be considered the heirs of ancient Russia (Lenin saw to that) and native (historically speaking) Russian values. Paradoxically, today’s Russian elite have more in common with the contemporary American elite which, by all appearances the Russian elite wants to emulate. No historical consciousness, which for centuries informed Russian governance, can be seen in today’s Russia. For this reason, the future is far from clear and the horrors of the recent past remain so fresh. Without redemption these horrors cannot be truthfully recalled (and, hence, vanquished). Under these conditions the White emigres have a humble mission: like the medieval Catholic monks who preserved knowledge and culture for better times, so must we keep these artefacts of our history and culture and preserve them for better times.